Photo right: The Rev. Corey Truett sharing God's word. Photo below right: From left to right, Paul Cline, Sean Gilliam, Elizabeth Bellipanni, and Nelson Coile. In this photo, they were on the countdown to worship. Photo credit Cynthia Laird. 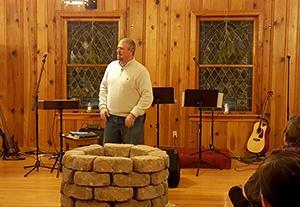 On Sunday, Jan. 8, 2017, The Well at Lewisburg celebrated its "Worship-Versary" (one year anniversary of joining in worship) led by Reverend Corey Truett. During most of that year, services were held at The Well's parent church, Maples Memorial UMC, in Olive Branch, Mississippi. 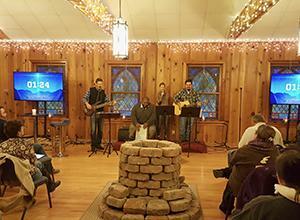 Recently, the congregation began worshiping in their building in the Lewisburg community located at 56 Vaughn Lane, in Olive Branch. The new location is still undergoing renovations. In addition to weekly worship, The Well will provide a place for ministry to all ages, outreach, and service to the community, and will soon offer a café as a place for people to gather. Each cup of coffee purchased will help farmers and workers in Honduras have fair wages, and help with building projects and sharing the gospel. Furthermore to the outreach abroad, The Well plans to put 10 percent of the profits from the coffee sales back into the Lewisburg community. Some of the outreach projects (before the opening of the coffee shop) included: tailgating at the home games of some of the local schools, running the scoreboard for 9th grade and junior varsity football teams. Other projects include speaking at events, praying for the teachers, providing recycle bins, providing coffee pots and coffee for teachers, giving hand warmers to teachers on morning car duty, and more. Truett spent 20 years in youth ministry, and also served as an associate pastor, college minister worship leader, and young adult pastor. He relates that during that time, a pattern emerged, and it became clear to him that God was sending him from place to place to rebuild youth ministries. Other pastors told him he needed to consider church planting. In late 2014, his spirit became uneasy, and he knew that God was up to something. He sought the counsel of a former pastor and was told that he needed to be church planting. At that point, Truett accepted the call for a new direction in ministry. At that time, Rev. Andy Ray, past Senatobia District Superintendent, sent Truett to be evaluated as a candidate for church planting. Once assessed, Truett and his wife, Heather, were brought to DeSoto County to view the area. Both of them were excited about the opportunity for ministry there. Truett felt an unmistakable spiritual draw to serve in the Lewisburg community. He said that his "children have grown up in the ministry and see the church as their second home." He further stated that he could not be more supported than with his precious family. The Well's congregation has participated in the Acts Bible study and has shared stories of their life and faith journeys. Some people have come to The Well where they began to understand, for the first time, that they did matter to God. Others have come to The Well with an idea of how the church is done, only to learn that church can be so much more than they ever imagined. Christians everywhere can be a part of this ministry even as they serve in their home churches. Ways to serve include: (1) prayer for the ministry to have an impact in the community, and to reach people for Christ; (2) financial gifts of any amount; (3) volunteer work at the church; and (4) donation of items such as toys or other supplies for the children and nursery ministries. To learn more about The Well ministry, visit the website www.LewisburgWell.com.